The secularists have ignored how the state recruits its employees to automatically contribute money from their paychecks to charities, which include several Christian nonprofits. 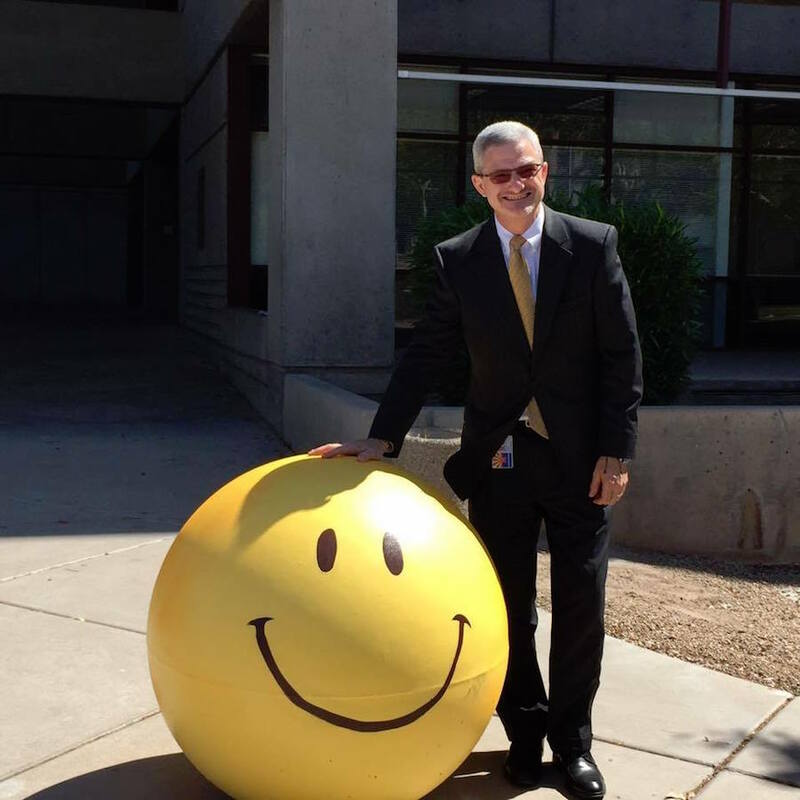 Tim Jeffries, the quirky director of Arizona's Department of Economic Security, poses with Mr. Smiley outside the DES building. He had the five round concrete barriers (to prevent a car from driving up onto the patio area) painted with clever themes. The director of the Arizona Department of Economic Security, Tim Jeffries, is under fire from a secularist group for mentioning to employees in an April email that they could give him “special intentions” — essentially prayer requests — to take on his next annual trip to a popular religious site in France. Jeffries is Catholic, and the Grotto in Lourdes is considered a holy place where people go to be healed. He has visited the sacred site every year for the past seven years, bringing letters from others requesting healing or other help. But Jeffries didn’t promote the Catholic faith, invite employees to church or request money for religious causes. All he did was offer a service employees were free to accept or reject. The state policy Jeffries is accused of violating requires that “Any use of State property for other than State-business purposes must be exercised in accordance with your agency’s policies and procedures.” His supporters have argued that nothing in DES’s policies and procedures would prohibit Jeffries’ email. Jeffries is only attempting to help the sick. He is not proselytizing to employees. He isn’t asking for money. Government employees do not check their First Amendment rights at the door when they get to work — in fact, unlike private employees, they have a right to all constitutional protections in the workplace. This is why the state is allowed to run a charitable campaign and include Christian organizations. The state government itself does more to promote religion than Jeffries could possibly be thought to have done in his email. Arizona State Government conducts a charity drive every year, encouraging employees to contribute money to a list of approved charities, several of which are religious. The Salvation Army is only the best-known of several Christian charities that state government employees may contribute to. A search on the Arizona State Employees Charitable Campaign website for the word “Christian” turns up Association of Christian Schools International, Chandler Christian Community Center, Christian Freedom International, Christian Legal Society, Christian Military Fellowship Christian Mission Teams International — Compassion and Gospel Outreach, Christian Relief Fund, Christian Relief Services and International Orthodox Christian Charities. Jeffries may have been singled out because it’s much easier to make one person a target, and his bold leadership at the agency has raised some eyebrows. Since being appointed to director of DES in early 2015, he focused on cleaning up the agency, which had been considered unfixable for over 40 years. He fired hundreds of the 7,700 employees for being “bullies … liars and multi-year bad actors.” So far, DES has exited 344 employees, of which six were arrested for illegal actions such as stealing. He has also gotten opposition for his op-ed articles refuting claims that reforming welfare will hurt the neediest. After the San Bernardino terrorist attack, which occurred at a similar type of social services agency, Jeffries increased the number of DES offices with armed guards from 26 to 50, with more planned. After the Brussels massacre, Jeffries unilaterally approved all colleagues — he refers to employees as his colleagues — to carry mace or pepper spray. Employees who formerly worked in law enforcement will be authorized to carry firearms. 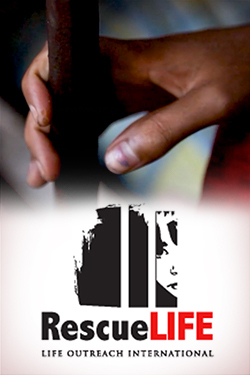 Jeffries has a long history of advocating for crime victims. When he was in college, his older brother, who was also his best friend, was murdered at age 22, stabbed 65 times. See this for the story of his coming to forgive his brother’s killers. Some of you may recall that my beloved wife Mary Frances and I are members of the Order of Malta. Among the many things, the 968 year history of the Order continues to amaze, humble and inspire us. The Order was founded in Jerusalem in 1048 AD, and granted papal recognition in 1113 AD. The Order’s global works for the poor and the sick frame, fuel and sustain us!! In fact, a couple of my tattoos are inspired by the Order, one reads “OBSEQUIUM PAUPERUM” which literally means “Obedience to the Poor” and the sick. Is that the best you can come up with? Maybe you should do some research on former directors of DES. He has done more in the short time he’s been here for staff and clients than the prior five did during their combined tenure. Now that would be more newsworthy than this. T. Jeffries is a good person and good leader !!!! He is not corrupt like the other heads of DES have been !!!! moral standing looking out for them should they fall upon hard times. Jeffries is the bully that he claims to despise. If you work for DES you are expected to appear happy all the time, anyone who does not is fired. His sanity is in question, his morning videos are cringeworthy. He wants stepford wives for employees. don’t roll your eyes, don’t grumble, and for the love of god SMILE (OR ELSE).